Utah's win over ASU and OT loss to AZ helped them with the computers. They picked up 4 future wins. Now have Utah as the favorite @Colorado, @OregonState, @Wazzu and vs USC. Projected 7-11 in Pac12 now. Oregon lost Bol Bol for the season so 13-5 is generous, especially after they lost to rival Oregon State in Eugene last night. Utah only plays Oregon once and it's at home on 1/31. Computers have Utah +4 for that game but that could change a lot in the next 3 weeks. the way Barefield and Tillman have been shooting can't and won't last forever. Need some big man help, it's really uncomfortable watching JJ do athletic stuff. Is there a timeline for Thioune? Will he play this year? I'm guessing Gaskin is redshirting? I thought with Hendrix leaving that Gaskin might play. 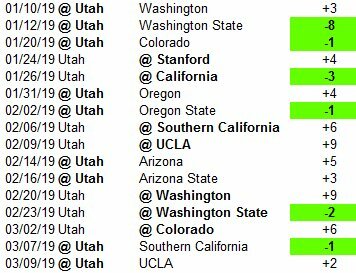 Anyways, this week vs Washington I see Utah +3 and favored by 8 vs Washington St. February looks rough with 5 straight losses and 4/7 games on the road. We'll see. NEW: Utah's win over ASU and OT loss to AZ helped them with the computers. They picked up 4 future wins. Now have Utah as the favorite @Colorado, @OregonState, @Wazzu and vs USC. Projected 7-11 in Pac12 now.